Blackstone Audio presents a new recording of this immensely popular book. 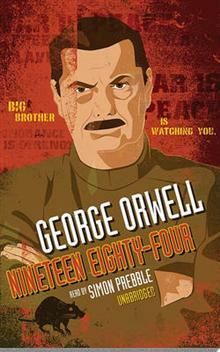 George Orwell depicts a gray, totalitarian world dominated by Big Brother and its vast network of agents, including the Thought Police, a world in which news is manufactured according to the authorities' wi... read full description below. George Orwell (1903-1950), the pen name of Eric Arthur Blair, was an English novelist, essayist, and critic. He was born in India and educated at Eton. After service with the Indian Imperial Police in Burma, he returned to Europe to earn his living by writing and became notable for his simplicity of style and his journalistic or documentary approach to fiction. Simon Prebble, a British-born performer, is a stage and television actor and veteran narrator of some three hundred audiobooks. As one of AudioFile's Golden Voices, he has received thirty-seven Earphones Awards and won the prestigious Audie in 2010. He lives in New York.